Regained a smidge of my creative mojo, y’all! I’ve been in a creative slump lately, drowning in the cesspool of the last couple of months. I recently decided to surface, catch my breath, and get my hips back to tablescaping!!! 🙂 I drew inspiration from Alberto Pinto’s book “Table Settings”. (Click here or on the “Books That Make You Go Ooh!” tab above to read my review.) I was drawn to his continental style that is markedly different and quite dramatic. Hence, the color palate used here is bright Mandarin orange, blue and white. To create this Oriental tablescape with European style, I started with a starched white floor-length cotton table linen. Floor-length in this case was a must to convey the relative formality of the evening. 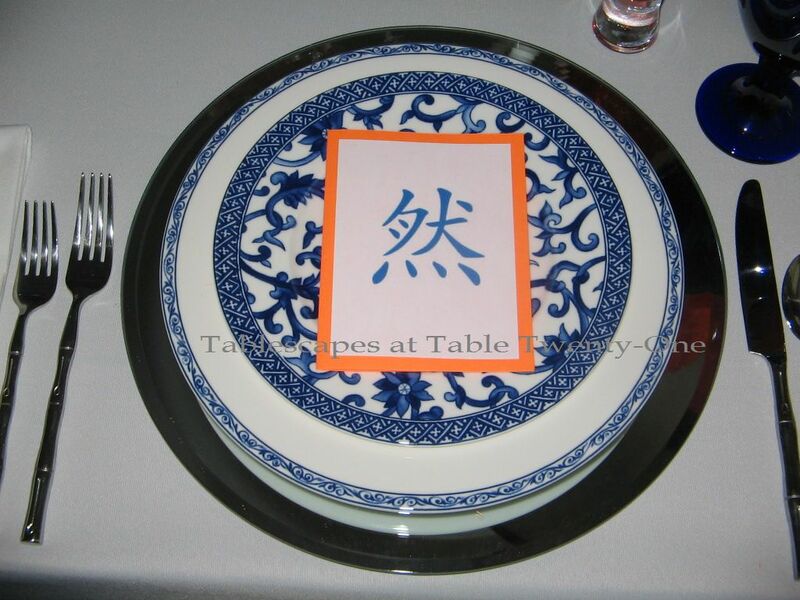 A 13″ round mirrored charger is topped with Ralph Lauren’s “Mandarin Blue” dinner and salad plates. 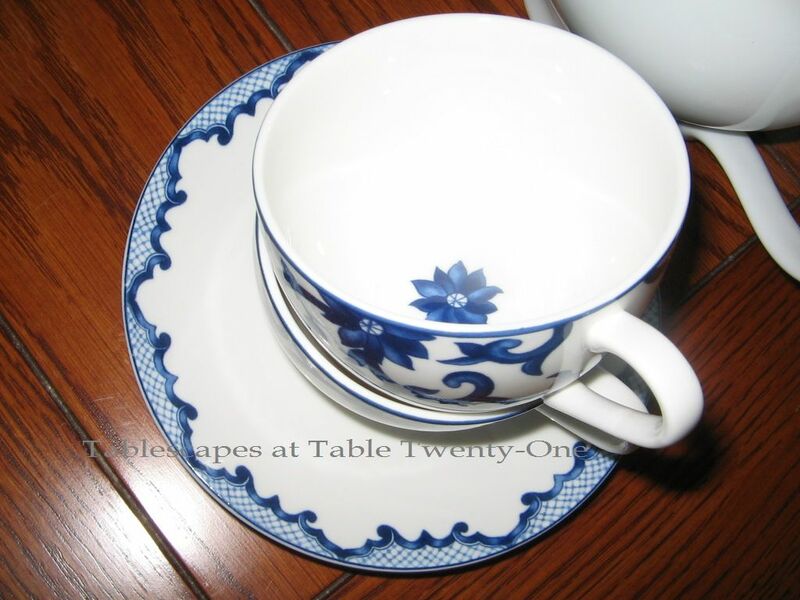 The plates have two separate but complementary designs. 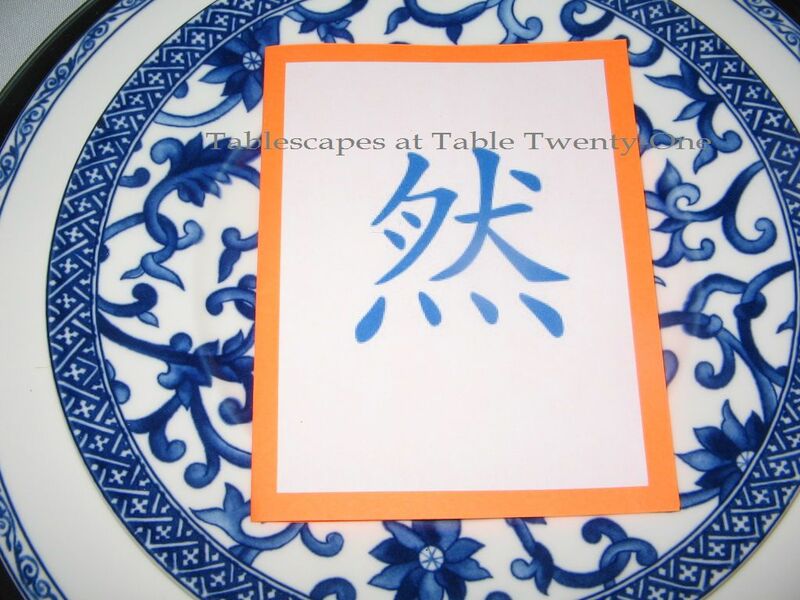 Other pieces in Lauren’s “Mandarin Blue” have orange flourishes. I created the menus using a lightweight neon orange cardstock layered with white. A clip art Mandarin symbol adorns the front of each and separates the listed courses. Now that my mojo is back, my love of energetic color has returned as well. 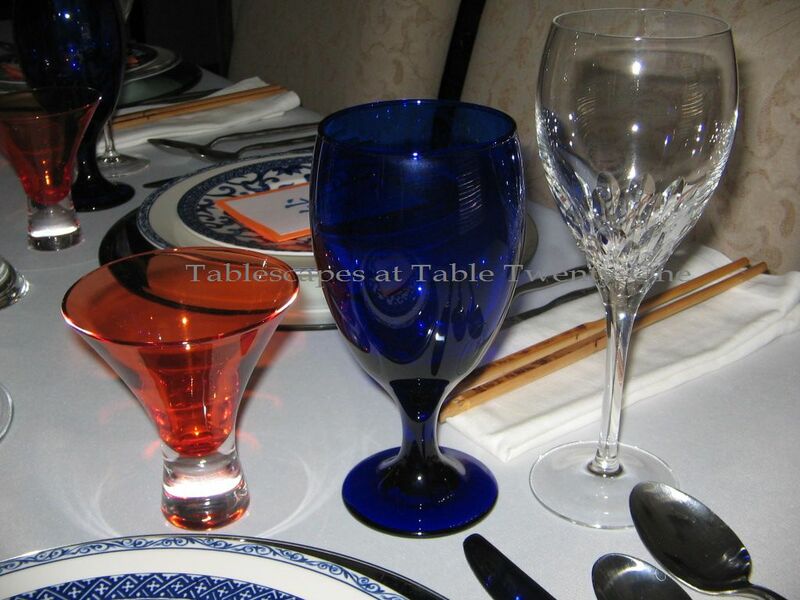 Cobalt blue water goblets from Pier 1 team up with Crystal d’Arques wine glasses and fun orange martinis in which dessert would be served. (Orange martinis found at Old Time Pottery.) This eclectic but complementary mix is typical Alberto Pinto style. 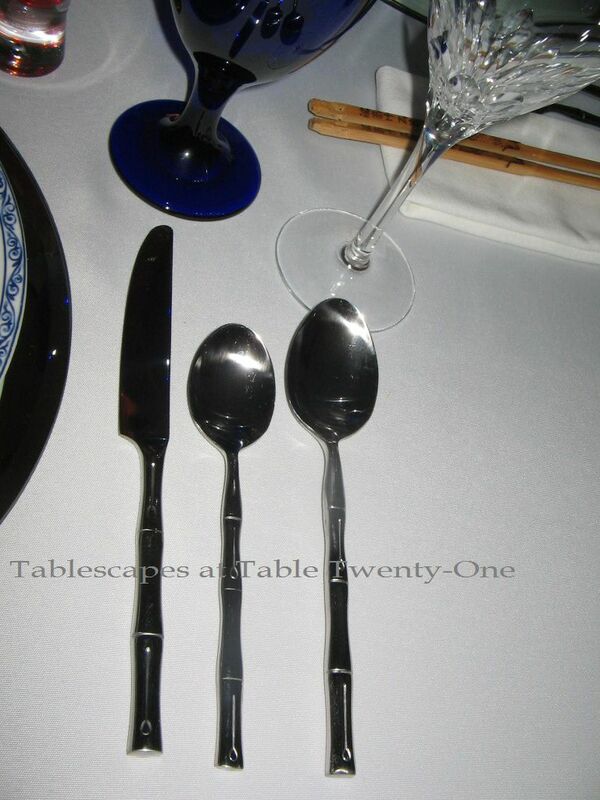 With dishes in a pattern called “Mandarin Blue”, it seemed fitting to use flatware with an Asian influence. 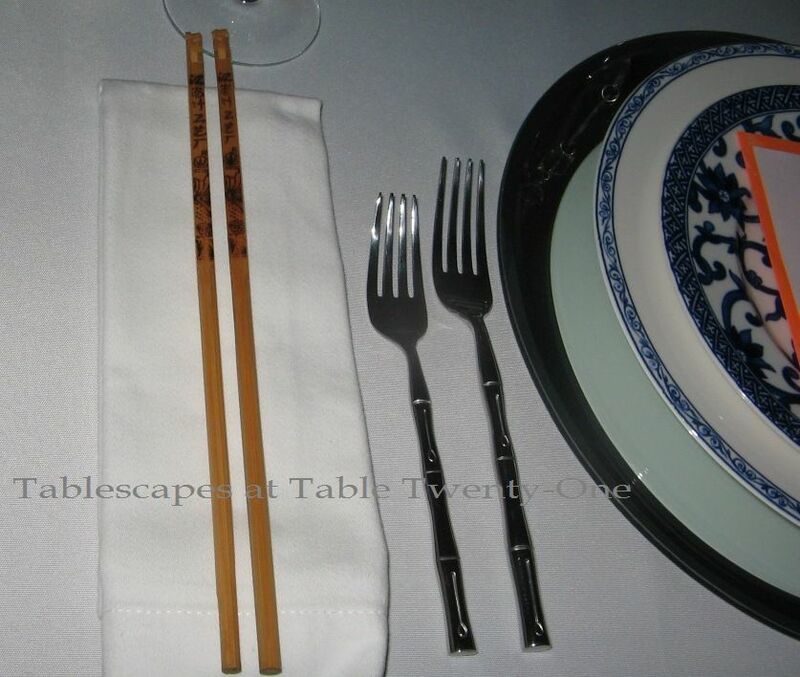 Adding a pair of chopsticks alongside the bamboo stainless flatware offers those with the necessary skills a chance to eat in an authentic manner. Gilded servants from Z Gallerie offer another level of intimate candlelight. The buffet display has a Z Gallerie 24″ orange wooden tray tucked behind an oversized ginger jar from Home Goods. 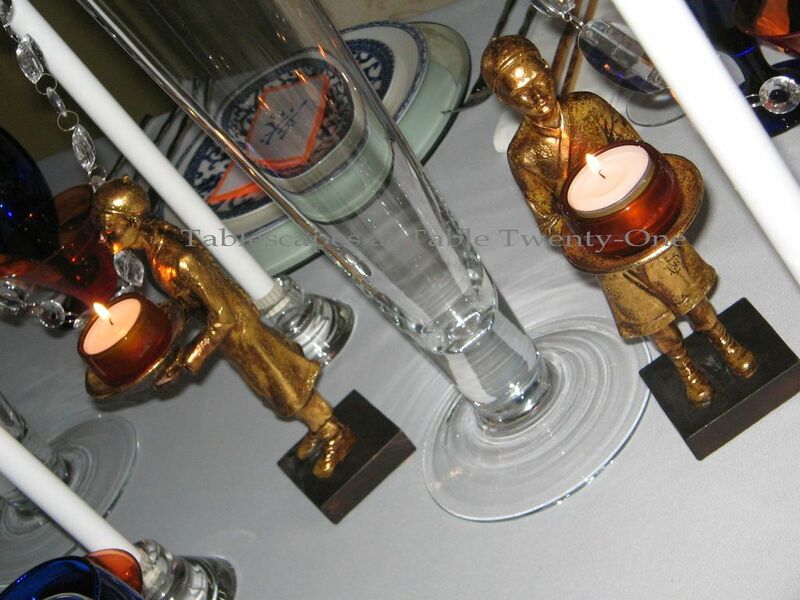 More servants with votive candles stand guard in front of the display. 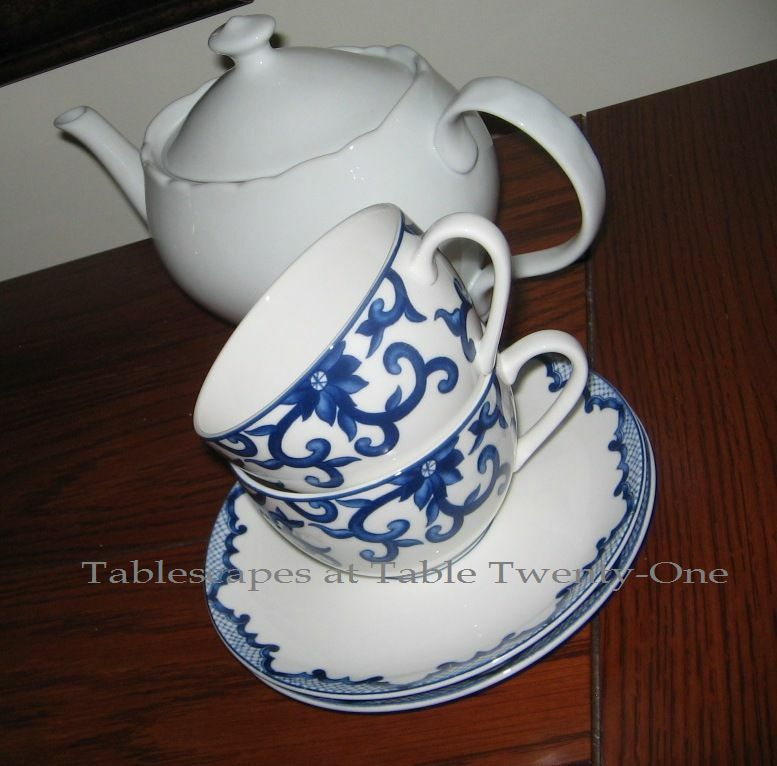 Tea service uses “Mandarin Blue” cups and saucers along with a simply designed teapot from Home Goods. Though very non-traditional in color & style for the holiday, this tablescape would be great for Chinese New Year! So…who says eating Chinese takeout is just for college students and sitcom characters? “Homey don’t play that!” 🙂 For me, it’s all about the Mandarin Bling!!! You are invited to join Susan at Between Naps on the Porch along with a bevy of wonderfully talented tablescapers for Tablescape Thursday. You can also catch me over at BeBetsy.com. See you there! Well, I am glad to see that you are back and with your mojo. I love the colors in this setting and the centerpieces are so unique and beautiful. Hi, Barbara! Thank you for coming by!!! I am so glad you like it! I agonized over what exactly to do with those orange balls for about 8 days before finally getting some inspiration from my Alberto Pinto book. Whew! What a crazy time!!! I’ll be by to visit your place soon. Take care! Chinoiserie….that’s the word I was trying so desperately to think of!!! I love blue & white, too. I think that’s why Carolyne Roehm is one of my favorite designers. I’ll inbox you later when I’m working from a more cooperative computer. This one is the pits!!!!!!!! We are in SE Missouri for a couple of days. I’ll in box you in a bit! Hi, Christine! I love the Asian look so much! There’s just something about it…!!! I’ll be by to visit your post soon. I’m working from my husband’s ancient laptop for a couple of days. I feel like I’m drowning in quicksand!!!!! See you soon! You’re baaaack! You’ve still got it! This looks great, and I know all the Auburn fans here in Alabama would just love to sit down to your table. The colors work divinely. Thank you, thank you, thank you!!! That means the world coming from you. I think you know that! Those are Auburn colors,huh? Well, I DID hit a homerun then….or should I say score a touchdown? 🙂 Thanks for visiting! I’ll see you at your place in a while!!! Welcome back to Tablescape Land, so good to see you! I just love the color combination! BEAUTIFUL! Thank you, Miss Debby! I’ll be headed over to your place soon. I’m from a MUCH slower and crazier computer for a couple of days, so it takes FOREVER for all the photos to download on everyone’s posts! Can’t wait to get back home!!! I’ll see you at your place later!!! Love your oriental table! I am also from orient and enjoy everything about oriental. Great setting and lovely shots too. Thank you so much, Sanghamitra! That really makes me feel good to know that you appreciate it given your background!!! I am humbled! I will be visiting your blog later today. I try to visit EVERY single one each week, and the going is slow this time since I have to use my husband’s laptop. Looking forward to seeing what pretty display you have this week! Take care, and thank you again for such a nice comment! Great minds think alike!! I, also, used orange and blue this week, and the same dinner plates!! So funny! And I almost went by Pier 1 and picked up those blue goblets, but I was short of time, so I used what I had. Your centerpieces are so very cool, love the way the crystals are draped. Those rose balls are awesome, did you make them? Glad to see you back in your creative form!! I believe we have similar taste, for sure. I have the same flatware, too! Makes me want to order take-out!! Wow!!! I can’t wait to get to your post to see!!! I am out of town and using my husband’s cranky ol’ laptop that runs at the speed of molasses, so it has been difficult at best to access posts because there are lots of pictures. Ugh! Can’t wait to get home tomorrow!!! I got the goblets at Pier 1 last year while they were on sale. I think I bought 14 or so. They really go so well with so many different looks! If you can hold out until end of summer, you can probably catch them on sale again. I think I nabbed them at $1.49 each. And you have that same flatware??!?!?! We ARE of the same mind!!! I’m glad you like the centerpieces. I didn’t really agonize over them, but I will admit to having sat the rose balls on the dining table to walk past them for a week as I wondered what to do with them. Thank goodness for Alberto Pinto! I didn’t make these particular rose balls, although I have some in my repertoire that I made awhile back. (Those featured in the “Princess Pink Birthday” post.) They are so easy to do, but pricey if you have to pay retail…which I do now since I closed my business. What was I thinking??!?! I’m going to try to hop on over to your place in a couple of minutes. Talk to you soon! Do you know what the Mandarin clip art says? The tablescape is very zen. I think it would set the tone for a serene gathering. You’d need some Oriental instrumental music playing quietly. 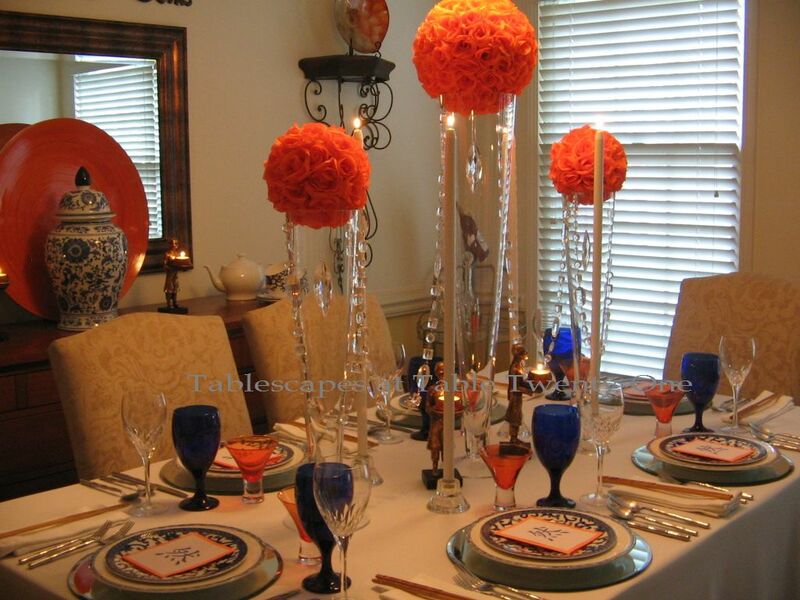 I love the color contrast of the cobalt blue glassware and the apricot rose balls. Hi, Joan!!!!!!!!! I’m reporting back from sunny Fesus, Mo.! I’ll inbox you later on that if I can get Ramon’t computer to act right. It keeps eating everything I write…plus, it’s awfully slow. I can’t wait to get back home to my good ol’ desktop with its lightening fast speed and features! 🙂 No, I don’t know in this instance what the clip art says. I often will check those kinds of things out, but this time I was going for form. I figured it wasn’t a cuss word, though, considering where I got it! 🙂 I can just imagine the sweet strains of Oriental music playing in the background. Oh, how I miss my dinner parties! 😦 😦 😦 I’ll FB ya later. Have a good one! Looks great and gives me ideas. Thanks for visiting my blog. There will be a tribute for Becky on Facebook on the 29th for her birthday. Let me know if you want the link. Hi, Monica! Yes, I would like very much to have the link to share in the tribute on FB. God rest her little soul! I just feel awful about it! Even though I didn’t know her personally, it still hits home as she was a part of the tablescaping and blogging community. Thank you for offering to share the link, and thank you for stopping in to visit my blog. I really appreciate it. Have a great weekend! Hi, Mary, and thanks! It felt good to get back on the horse! 🙂 I’m just hoping the creative streak doesn’t do a sudden about-face on me! 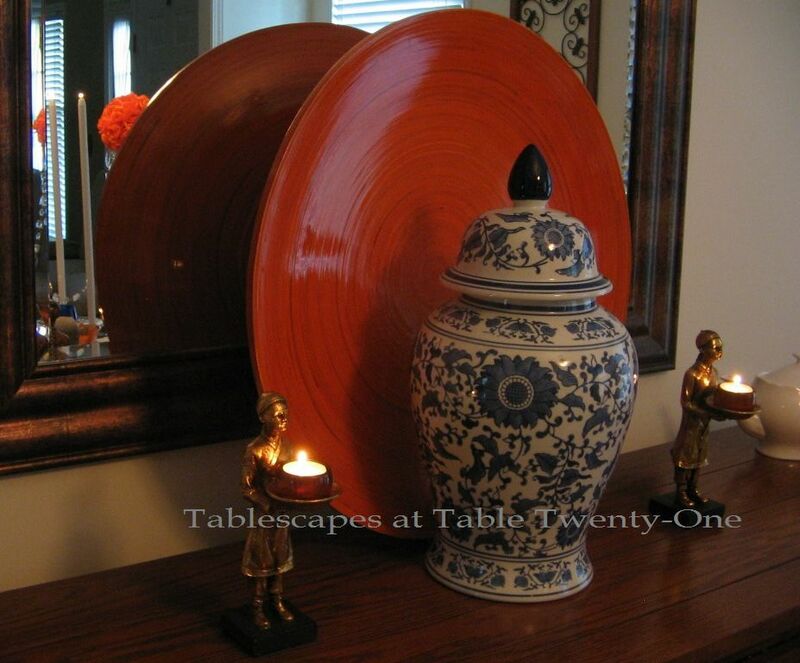 I love to use blue and orange in my home decor but haven’t yet in a tablescape. I am going to keep an eye out for some orange dishes next time I go shopping because I really love the look you created, traditional yet fresh and modern. Thanks for the inspiration! Thanks, Taunnie! It really is a great look because I can enjoy all the traditional decor without being accused of being “old-fashioned” by my son! 😉 That orange really does freshen it up! Such amazing tables you set. I loved the flower balls. Karin! Hi!!! Thank you so much!!! I’m working from my husband’s laptop while we’re out of town, so it is taking me forever to look at everyone’s post. This thing is SO slow and keeps eating my words! I hope you have a wonderful weekend, too! Stunning color! Adore using the orange with the blue! Thank you so much! It was a new way to go for me, but I like it, too!!! Alycia, Honey, you’ve got your mojo back!! The mandarin and blue really pops and stimulates the appetite. I never realized that about orange and blue. Is that supposed to happen? 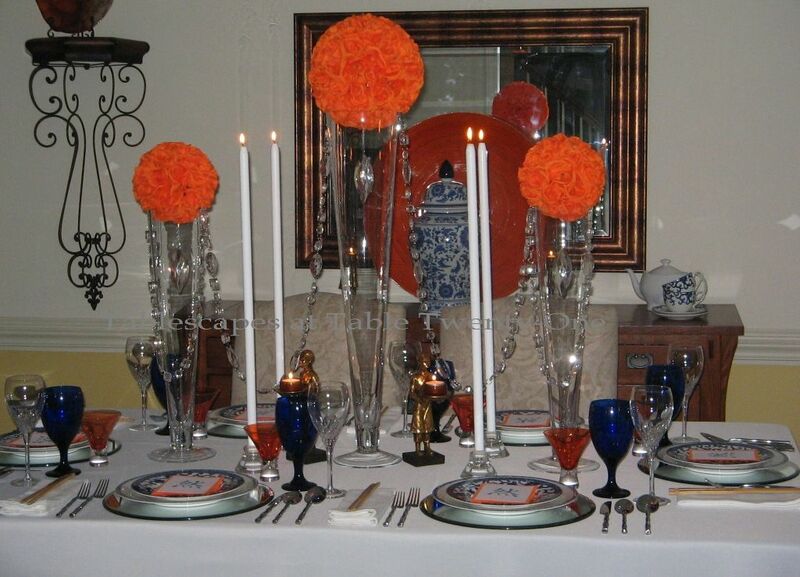 The RL plates are beautiful, of course, and the orange rose ball are so dramatic. Wow! Stunning! Hi there, Babs! It is so nice of you to drop by!!! Thank you so much! Yes, orange is the “new red” and is fabled to stimulate the appetite. It certainly does in my house! I love all the orange in our dining room. I’ve tempered it with a bit of yellow so as not to freak my husband out completely. 🙂 Thanks again for stopping by. See you soon!!! Welcome back! What an eye-popping table! This table is definitely for adults; as you said not takout for college students. This is very elegant and so very authentically mandarin. The rose balls are very dramatic and really coordinate well with the cobalt blue and the white. This is just a really fun and sophisticated table. Hope you have a great weekend! Hi, Denise! It’s crazy, isn’t it???!?!! All this color!!! I love it, but it kinda scares me, too! Alberto is a wild and crazy guy! I love his stuff, but I don’t think I could go this wild all the time. Hope you had a good weekend! You may have out Pinto’d Albert Pinto!!! You left nothing out. I’m so happy to be receiving the gift of your creativity today. You need to come with me to the America’s Mart for the gift show and see the showroom that has the Alberto Pinto china. Table after table after table. Such beauty! You’ve inspired me to think blue and white again. I felt I was so stale with it, but that orange sends me to the moon! How brilliant you are. Keep it commin, my friend! I love this table. The little details of the menu card are so specially thought out. 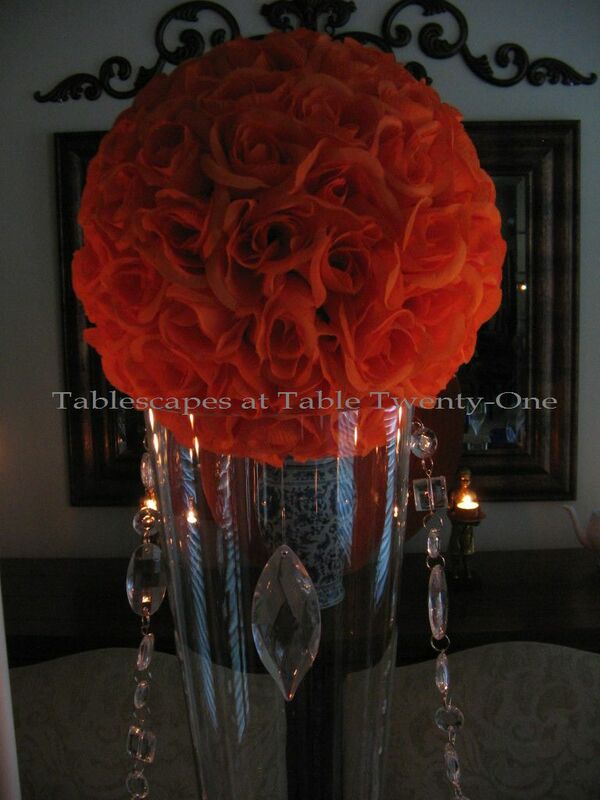 The orange rose balls are stunning as are the fun orange martini glasses. I love the guilded servants holding the tea lights- precious! Love that orange! Hi, Susan! Thank you so much!!! Beautiful tablescape today! Thank you for stopping by and leaving me a comment. I hope your mojo continues since you show such talent. Thank you, Jan! I’m glad you came by to take a peek! Hey Alycia! I’m SO very glad you’re back with a brand new knockout of a table! I’ve missed the creative magic and exuberance you always bring to Tablescape Thursdays! Love the exotic drama you’ve created here — from concept to execution — perfection! Bill, my sweet! How ARE you!!!??!??! Great to hear from you! I’m glad you like it. For some reason I was feeling bold and powerful on this day and allowed those feelings to translate to the colors and decor on the table. I have since retreated back into my “safe mode.” 😉 So glad you stopped in!!! I love the blue and orange combination and those menu cards are the best! Thank you, Pattie! I’m so glad you stopped by! I really enjoyed your post with the great crab plates!!! I haven’t used my lobster ones yet, but you’ve inspired me! Take care! 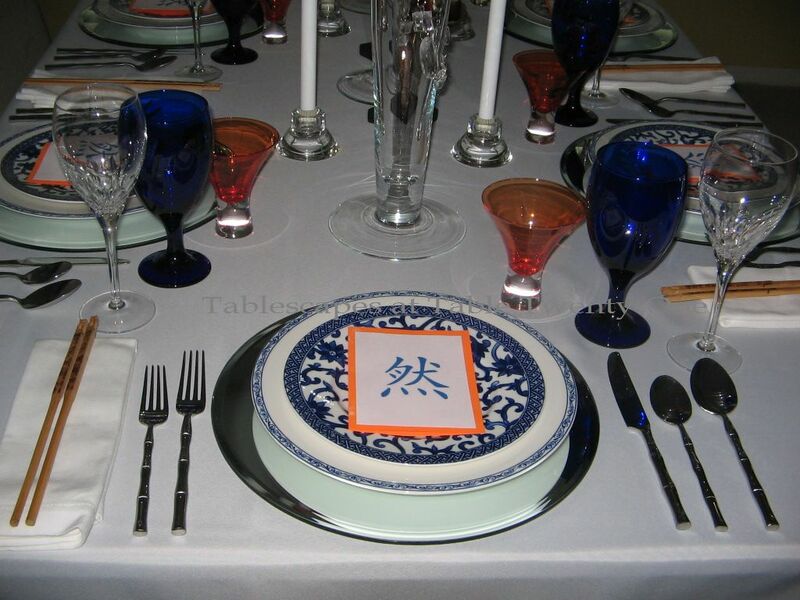 What a gorgeous oriental tablescape with European flair! Love the little menus you created too. Just beautiful. Hi, Donna, and thank you so much! I’m so glad you like it! It’s not my “usual” style, but I’m kinda digging it! 😉 I do hope you’ll stop in again sometime soon! Take care! Love, love, love those rose balls and in that color, amazing! I think many of us hit the “burned out” mood lately. Maybe it was the sunshine or the heat, but I’m just starting to want to cook, shop and decorate a little bit. The Halloween items are stirring me up a bit! This is a gorgeous table. It seems as if your creativity came back full force. Hi, Sue! I was in the store yesterday and noticed that a lot of fall and Halloween items are already out on the shelves! My goodness…I’m still trying to recover from this extended heat wave we called summer!!! Thank you for stopping in today. I really appreciate it! Thank you for stopping by, Pamela! How could I possibly forget that fabulous table linen you had going last week??!?!?! Neat table indeed!!! Thanks again, and come back any time! Hello, everything is so beautiful. how did you put the hanging crystal? I am doing a centerpiece similar to this but I am not sure how to glue them and not fall.